Cape Breton is well represented at the 2018 East Coast Music Awards with 16 Cape Breton Nominations such as Matt Minglewood for Blues Recording of The Year, Pretty Archie for Country Album of The Year, and the list goes on! Cape Breton has been known for home grown, amazing musicians coming onto the scene. Some wonder how the music gets from the musician to you holding a CD in your hands, or downloading the MP3. 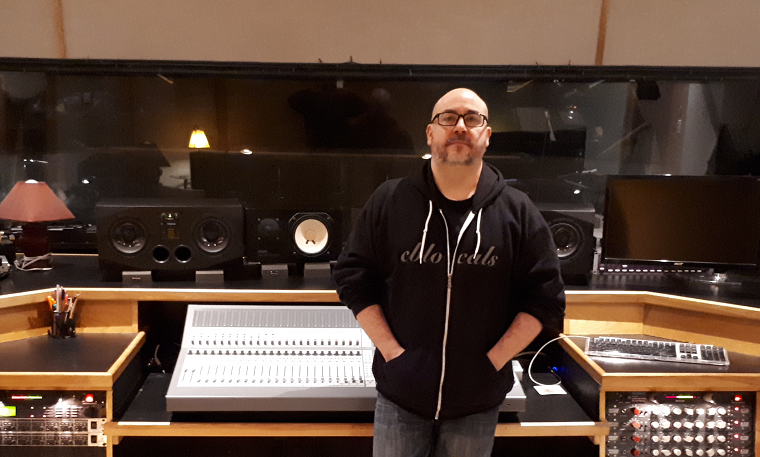 Jamie Foulds, Nine-Time East Coast Music Award Winning Studio Engineer of The Year started his career back in 1991, after being in the popular Cape Breton Band Realworld. Being involved in the recording process of their first recording, Jamie became really interested in the production side of accomplishing a finished project. Foulds went on to become an assistant engineer at Overtom Productions shortly after the release of his band’s debut Realworld record. When he was in between touring with the band, he would be in the recording studio, trying to learn as much as he could about the process and the equipment. Unfortunately, Overtom Productions had a fire, which destroyed the studio, and they were forced to close down leaving Jamie without a place to work! During that period, Fred Lavery & Gordie Sampson were starting up Lakewind Sound Studios. Jamie was brought on as their first Studio Engineer working along some of the greats in the music industry! After a few years, Overtom Productions decided to rebuild in Irish Cove, Cape Breton. The studio was re-branded Soundpark Studios, and had influencers from Nashville to design the first of its kind in Cape Breton residential style recording studio, with bedrooms and a full kitchen to make the stay there comfortable for all artists. Soundpark needed Jamie to help with the project, and Jamie decided to come back on board and be full time sound engineer! This incarnation of Soundpark Studios was the home of many now classic East Coast recordings, but it had run its course by around 2004. Jamie decided to grab ahold of this opportunity and was able to buy some of the equipment and start a full time career on his own. Jamie found a location in the Sydney River area, close to home, where he could set up shop and start a new beginning. There was a lot of work ahead, between 2004 - 2005 construction at his new location, Jamie still had to maintain work in the industry, he was able to get a room from MacKenzie College downtown Sydney to be able to mix & edit recordings before his studio could open. In the Spring of 2005, just before he would officially open his doors and last minute construction had to be completed, local musician, friend and producer Ed Woodsworth would come calling. Jamie was asked to work on a project with Ed, “Short Stories” from award winning New Brunswick artist Jessica Rhaye, which would become the first recording project in the new Soundpark Studios! After the opening, Jamie was off and running with continuous audio productions with the best of East Coast artists, countless East Coast Music Award nominations for Recording Studio Of The Year, and taking home the win in 2014 with the ECMA for Recording Studio Of The Year! When Jamie is not working with music recordings, he doesn’t stray too far away to work on audio productions such as dialog recordings & editing for animation such as “The Secret World of Og” for CBC & working with Membertou First Nations on their Translation App & Books On Tape with Mi'kmaq Language Translation! Since 2012, Soundpark Studios & NovaStream Inc. have been working together to live stream select concerts from The Celtic Colours International Festival every October for 9 shows in 9 nights! Working on the live stream, Jamie is behind the scenes in production laying down a multitrack live recording during each show. After the festival is over, Jamie and Producer Declan O’Doherty sit in his studio to drink coffee, mix, edit, drink coffee and repeat day in and day out for about 10 days to make sure a finish product is out in time for Christmas for all those Celtic Music lovers around the world who ordered the CD during the festival! Jamie Foulds continues to deliver with each and every production that he lays his hands on! “I just like making stuff, I like the creative process, I like that feeling of accomplishment”, says Jamie when asked why he started in this industry. The recording industry on Cape Breton is full steam ahead with the likes of Jamie around who strive to keep moving forward!